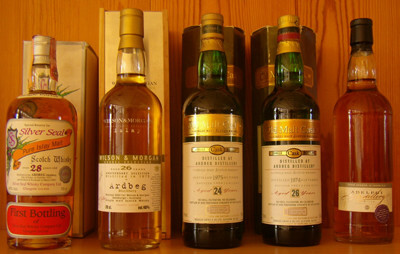 The three big Ardbegtastings 2008 were a big success and many people including myself wanted to see if we could do a tasting with Ardbeg's from their golden era, the 1970's. Said and done, I started to hunt down bottles suitable for this tasting. I am translating this text from Swedish to English in 2018 and now that I look back at this tasting it was lucky I did it then because it would be very expensive to get these bottles today. 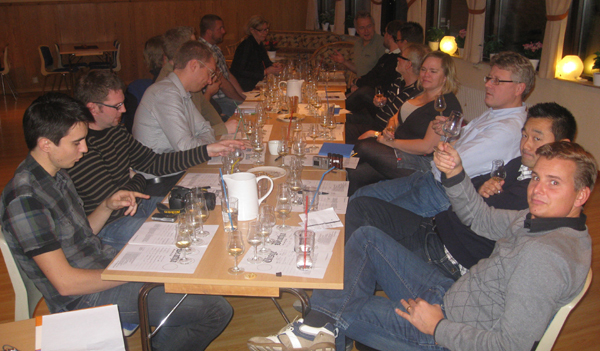 The 35 people on this tasting paid 2000 SEK (about 200 euro) for 2 cl of each of these whiskies! 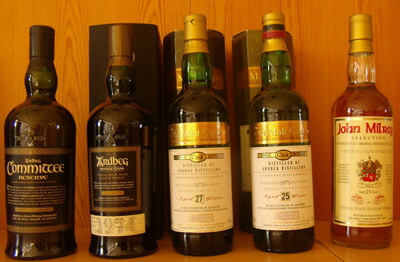 I didn't want the tasting to be just 1970's Ardbeg, its should be really good 1970's Ardbeg too. In addition to some OB Ardbegs that should be on such a tasting I looked for bottles that had scored at least 90 points in average at Malt Maniacs. That was a challenge in itself to find these bottles and still keep the budget for the tasting. The number of bottles were set early to 15 to keep the cost down for the people coming to the tasting. It was after all a quite expensive tasting with 2000 SEK per person (turns out it was very cheap, really), but the bottles at the tasting wasn't any everyday bottles either. The tasting was a huge success. I scored 90 points or more for 10 of the 15 whiskies. We actually had 16 whiskies as I included an Ardbeg TEN, L7 in the first flight so we had some sort of benchmark. In the first flight the 1977 was the winner (91p from me). It wasn't any surprise as it's a very good whisky, bute the 1975 (90p from me) was close behind. There were two disappointments, the 1978 only got 78 points from me and I was also expecting more from the old 10 YO clear bottle. I gave it 81 points. I had saved the topnumbers for the second flight and it was an amazing flight indeed. The winner was the John Milroy bottling (94p from me) and the worst score was 91p for the Old Malt Cask 1973, 27 YO, 282 bottles. The other three in this flight scored 92 points in my book! I found another two 92 points whiskies in the third and last flight and among the participants the Adelphi was voted the winner of the flight ahead of the Old Malt Cask 1975, 24 YO, 234 bottles. We kept the previous format of the tasting with 2 hour tasting, 1 hour foodbreak, 2 hour tasting, 1 hour foodbreak and another 2 hour tasting. In the list below you can see all the whiskies we tasted this wonderful day. The points in brackets are the average score on Malt Maniacs at the time of the invitation to the taasting (January 2009).